Typing Practice: learn how to type faster using blind ten thumbs touch typing. Typing for beginners: learning to type in a mater of an hour. Multiple languages and keyboard layouts, fast and easy to use software. 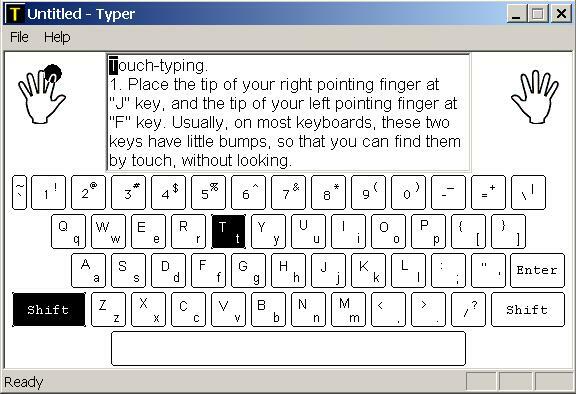 Touch Typer is a small, easy to use and flexible typing tutor software, that teaches you speed typing in just few lessons. We cannot guarantee, that it is the fastest way to learn to type, but we can't name a program that teaches touch typing faster, either. Installation of Touch Typing Software. Download the Typer archive. Unzip it in the directory where you want this program to resign (we suggest S_Projects). When specifying options in your Winzip software, make sure that all subdirectories (subfolders) are restored. Usually it is the default setting for the WinZip. Installation is complete. Uninstallation of Touch Typing Software. Delete the folder containing the Typer files. If you choose to register the Typer software, you will need to enter the password (provided after the registration) into the registration prompt (Help - Register). Sit straight, with your feet flat on the floor. If possible, your back should be supported by the back of the chair. The way your workspace is organized, is very important, the right posture will improve your typing speed, and help avoiding some professional problems, like the back pain. Place the tip of the pointing finger of your left hand at the 'f' key. Place the tip of the pointing finger of your right hand at the 'j' key. On most keyboards, there are little bumps on these keys, so that you can locate them by touch, without looking. Put the rest of your fingers at (from left to right) 'a', 's', 'd' (left hand) and 'k', 'l', ';' (right hand). Your thumbs should gently touch the space bar. As you type, your fingers will leave the abovementioned buttons. Make sure they only move away for a short period of time, to press the necessary key. After it is done, they should slide back to the "ready position". This way you always can know where your fingers are, relative to the keyboard, without looking. Start the Touch Typing Program. On the main screen, you see the text that you will type, the keyboard, where the current key is hilited, and two icons, for the left and right hands, showing you which finger to use to press the current key. If you press the wrong key, nothing happens. If you press the correct key, the selection changes, so you need to press the next one; again, you have a tip on which finger to use. Limited support for a language - what is this? The only language both author and this program support is English. With some help from the friends, Russian was added. What about the rest of the list? The problem is to find a text, in a specific language, that the user can use, to practice. The text should be (C)-free and grammatically correct. Google has a nice "translate" feature, but the results are still below our standarts. The situation is rather unusual: the program CAN work with almost any language, but the author cannot find the text in this language, because he does not speak it. So the decision was made to release this typing tutor software with "limited" support for languages that the author does not understand. It means, that if you see, say, German in the list, you can't use it right away. First, you have to find a text in German - any text. Then you need to go to program's data directory (typer\data), find the german.rtf and german.txt files, and copy-paste the text there, replacing the text they contain. We suggest, that you use Windows Notepad to edit TXT file, and Windows Wordpad to edit RTF file. Just click "Start" button (usually, at bottom-left of the screen), select Run and type Notepad (or Wordpad). Make sure, that a) both RTF and TEXT files contain the same text, up to the last space, and b) that you save your TXT file as Unicode ("Save As Type" fiels in Save As dialog box). After this is done, the program should support the language (also, visit this link to learn how to add a new language, one that we do not support yet. Program ships with few languages. If you need to choose one of them, select "language" from the main menu. Note, that usually adding a totally new language (one that we do not ship) is a relatively easy task.